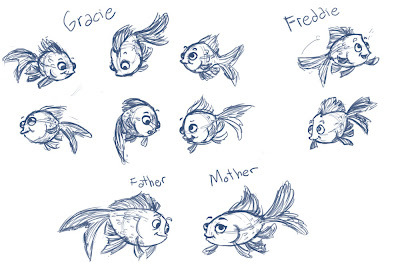 Lillian Lai's Sketchblog: Illustrating a children's book "Gracie's Got a Secret"
Illustrating a children's book "Gracie's Got a Secret"
In Gracie’s Got a Secret, an impatient and feisty little goldfish named Gracie escapes her fishbowl and leaves her family, determined to share a secret with the outside world. Along the way, she befriends a weepy alligator who’s stuck in the sewer and a circus elephant with dreams of freedom. By helping her new pals, Gracie learns to slow down and go with the flow, gaining remarkable results and a clear way back to a loving home. This uplifting story, which comes with engaging questions to prompt discussion, invites children to believe in themselves, support others, and find their inner stillness. I'm very glad for this opportunity.The process of working with Heather and the publisher has so far been very engaging with great feedback and an enjoyable unfolding in finding the characters and story. I'll keep you updated and hope you'll take a look at it when it's done! Holy cow, this is so exciting! I can't wait to see it when it's done, I'm sure it'll be fantastic! Awesome stuff! Awesome news! Awesome Lil! Can't wait to see the final product either! woah! way to go lillian! congrtats!